One of my favorite parts about living in New York City is strolling the streets, iced tea in hand, scanning new restaurant menus, popping into little stores, and debating if I should actually buy something this time around. I especially love little delis and specialty grocery stores that cater to another country’s staples. Every time I’m around St. Marks Place in Alphabet City, I have to pick up a bag of my beloved Bamba (peanut butter cheetoh-like snacks!) at the Israeli store Holyland Market (and then force whoever I’m with to share). And when on 1st Ave, I without-fail pick up a bag of the deep-fried curly-q cumin seed crackers I fell in love with in Delhi at the little store underneath the two competing Christmas light Indian restaurants (y’all New Yorkers know what I’m talking about, right?). Another favorite is a stroll thru Sunrise Mart, although I don’t yet have a go-to snack in this Japanese wonderland. Usually I get cheap noodles, a rice ball, or something mochi-related. This time around, I was curious about the instant dashi soup mixes. Dashi is soup base, made from simmering kombu (a thick kind of seaweed) with bonito fish flakes. I’ve never made my own, but I’ve long thought it a great option for my pescatarian lifestyle. A google search once I was home told me I got the no MSG brand (sweet!) and that everyone disagreed about how much soup powder you’re supposed to use per cup of boiling water. I ended up using almost one of the pouches, which was about a teaspoon and a half, with my two cups of boiling water. The powder, or really it was more like tiny pellets, dissolved immediately. A little fishy but fairly subtle. I deem this a nice (and cheap!) flavorful base for soups or simmered veggies like this. First, prep your squash. Peel some of the skin off (with a paring knife or powerful peeler). It’s fine to eat it, but peeling just some gives a nice texture change. Cut squash into roughly 1-inch cubes (more or less bite-sized). Next, get out a heavy saucepan you have a lid for. If making dashi, bring water to a boil; add seasoning packet and stir to dissolve. Add squash pieces and return to a boil. If not making dashi, bring veg broth and squash to a boil. Turn temperature to a slow simmer and cover pan halfway. Simmer for 10 minutes. Add sugar, soy sauce, and mirin and continue simmering for another 10 minutes, uncovered. At this point, squash should be very tender, but hopefully not falling apart. If you’d like a more syrupy sauce, remove squash pieces and continue simmering dashi mixture until it thickens, 3-5 more minutes. Three years ago I returned from Israel on the Fourth of July. I was flying down the East Coast just as it became dark. My return to the US was celebrated with hundreds of different fireworks displays out the window, dotting the horizon as we hurried from Toronto towards JFK. Every suburb along the route outshined its neighbors with their colorful luminescent displays. After a month of touristy activities and solitary explorations (and amazing hummus), I was elated to be above this spectacular opening of America’s arms, witnessing this celebration of her might. This year, as July 4th loomed closer and no plans to escape the city materialized, we decided to embrace the opportunity to make our own event. A grill grate and coolers and folding chairs were purchased, and now you can officially invite me to a suburban soccer game because I own One of Those Chairs That Folds Into Its Own Bag. So does Daniel. They were $8 (yay Home Depot!). We dressed in red, white, and blue and ate delicious food with lovely people in our inviting backyard. We made elotes, grilled veggies, and burgers aplenty, gorged on salads and grilled peeps (yes you read that right–it was time for the Easter candy to go), and giggled over a drunken bout of Cards Against Humanity. Although not condensable to a single moment or story, it was a total success! Memories made. and oh! These greens? Definitely didn’t make an appearance at our joyous Americana evening. 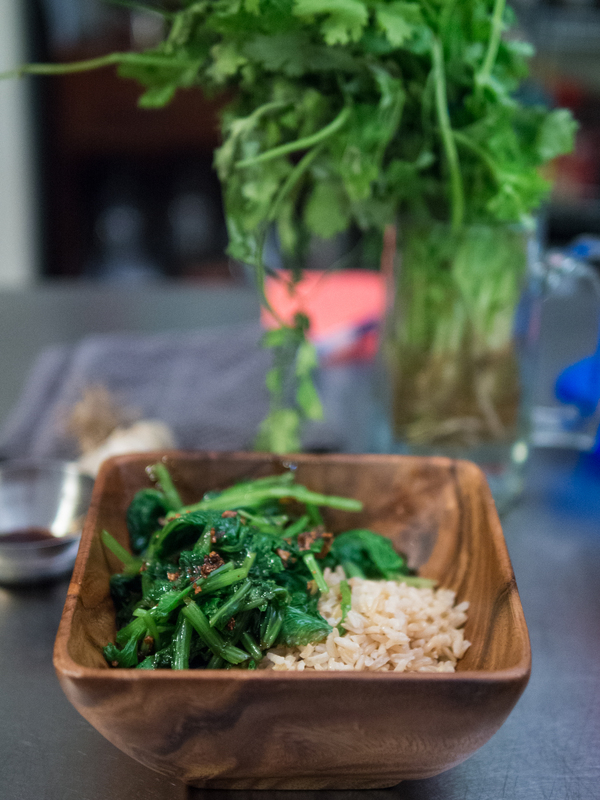 The recipe’s simplicity and promise of “just like dim sum!” were enough to give it a go the next day, after all the dishes were washed, the yard was cleaned, and a nap was had. I super recommend it: easy, filling, light, and delicious. Mustard greens, til we meet again (probably in tomorrow’s CSA basket…)! Set a large pot of water to boil. When it’s boiling, add the two drops of canola oil. 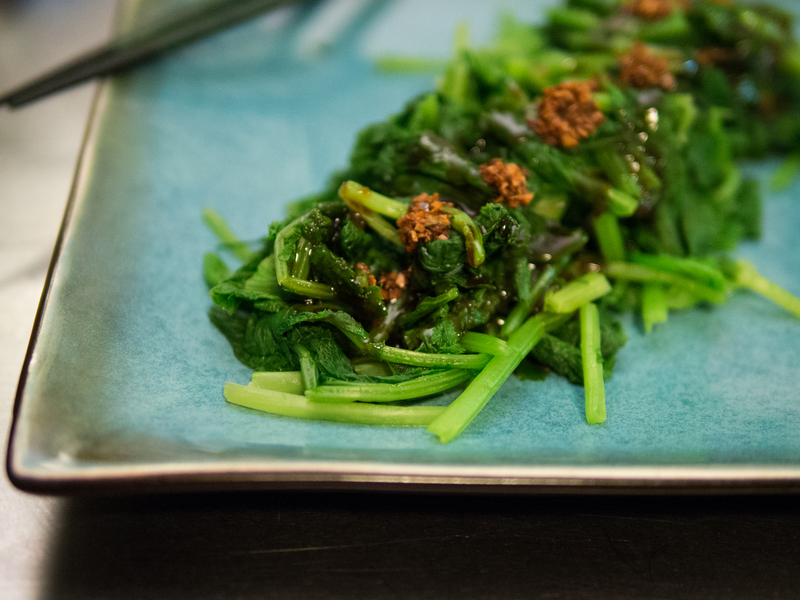 Add mustard greens and cook for 30 seconds to a minute, or until the structure starts to breakdown and both leaves and stems are soft. 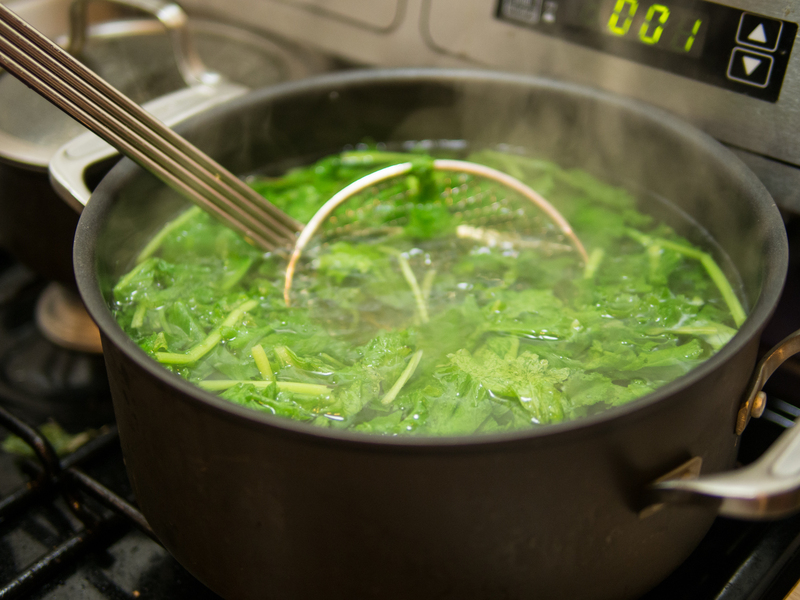 As soon as this happens, use a slotted spoon or spider to transfer greens into a colander. Rinse with cool water. Dry well, either with towels or a salad spinner. For Garlic Oil: Heat a small skillet over medium heat. Add oil. When shimmering, add garlic and cook until oil is fragrant and garlic is browned. This happens very quickly! 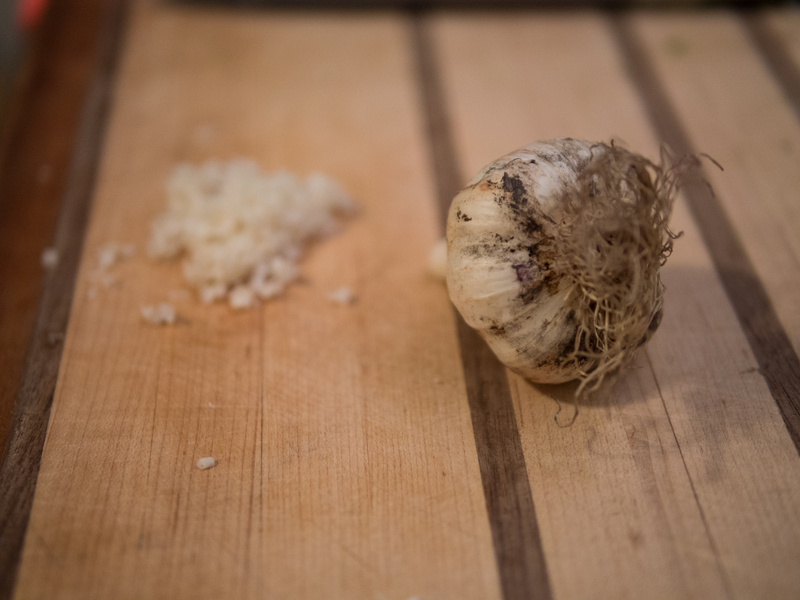 Could be as short as 10 seconds, depending on how finely you mince the garlic. 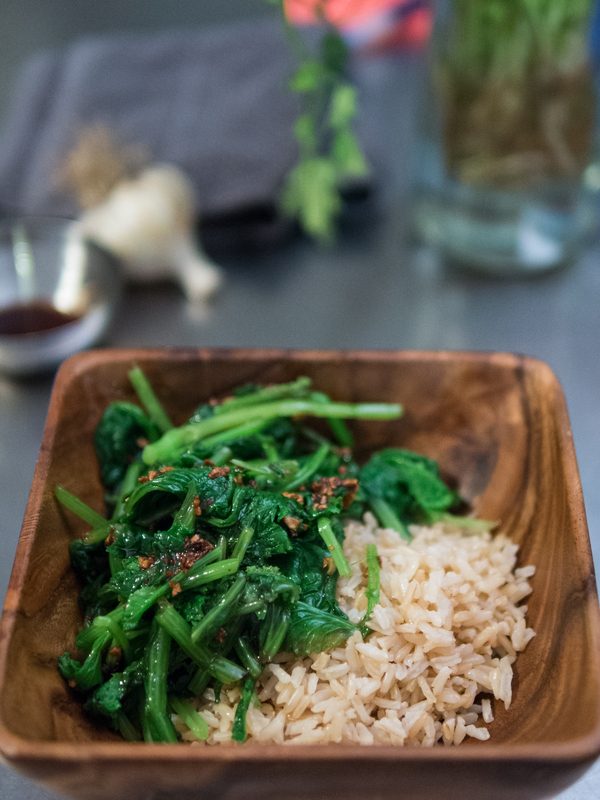 Pour oil and fried garlic bits into a small bowl and set aside. For Sauce: Return empty garlic oil pan to medium heat and add oil. Add next 4 ingredients, being very careful. Pan may sizzle! Cook together for about 15 seconds, until ingredients are cohesive and viscous. Arrange greens on a serving platter. Top with sauce and garlic oil. Delicious served with brown rice. 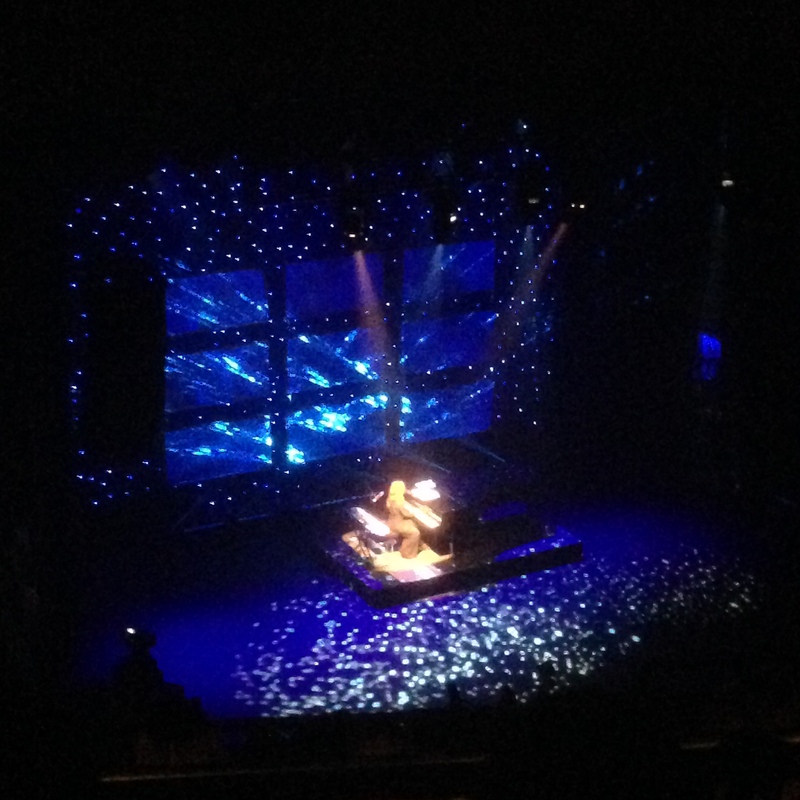 I went to a Tori Amos concert. With a group of friends, including 2 straight men. One of whom is my boyfriend, who has already seen Tori four other times. Perhaps surprisingly, I was introduced to Tori in the first place by my high school boyfriend. My dad took me to my first, second, and third concerts (Natalie Merchant, Mary Chapin Carpenter, Sarah MacLachlan). All artists I discovered through his CD collection. So I guess the men in my life like folksy female singers. Whatever, no shame. They have good taste. Anyways, Tori, at 50 years old, is an incredible performer. We should all be more like her. Maybe she got that way by eating potato salad. With kale. And green beans! Delicious when served with beet reuben sandwiches for dinner. To cook potatoes: Put (rinsed) potatoes in a medium pot and add enough cool water to submerge potatoes. Add sprinkle of salt. Bring to a boil and cook for about 15 minutes, uncovered, until fork-tender. Drain and set aside. When cool, cut into bite-sized chunks. To make green beans: In same pot you made potatoes in, bring 2 inches of salted water to a boil. Add green beans, return to a boil, and cook for just 1 minute, until more pliable but still crunchy. Drain immediately and set aside. When cool, cut into 1/2 inch segments. Heat 1 T olive oil in a large pan. Add garlic and red pepper flakes and cook over medium-high heat until you can smell the garlic, 1-2 minutes. Add green beans, potatoes, and smoked paprika. Stir constantly until the vegetables are coated in paprika. Cook about 5 minutes, or until potatoes are slightly crispy. 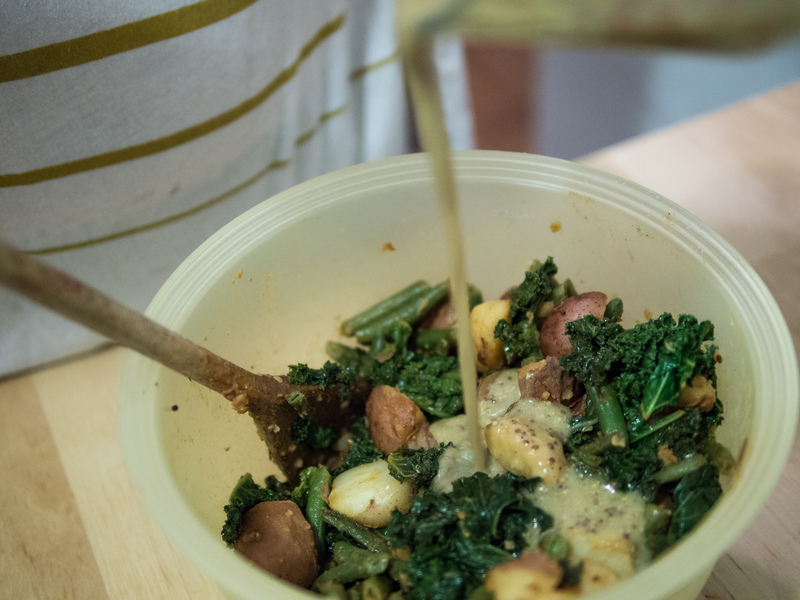 Add kale, 1/4 cup water, lemon juice, s&p, and another small drizzle of olive oil. 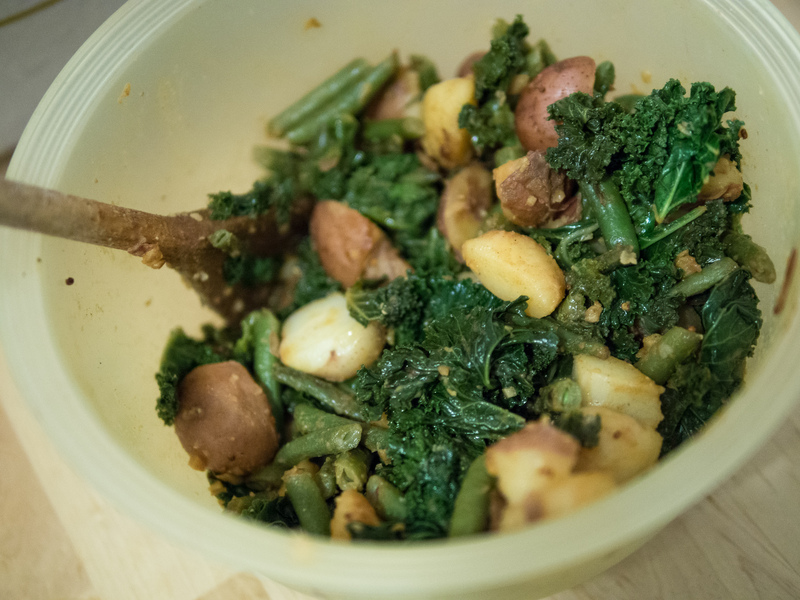 Cook until kale wilts, stirring frequently, making sure all ingredients intermingle. Pour into a bowl and let cool. 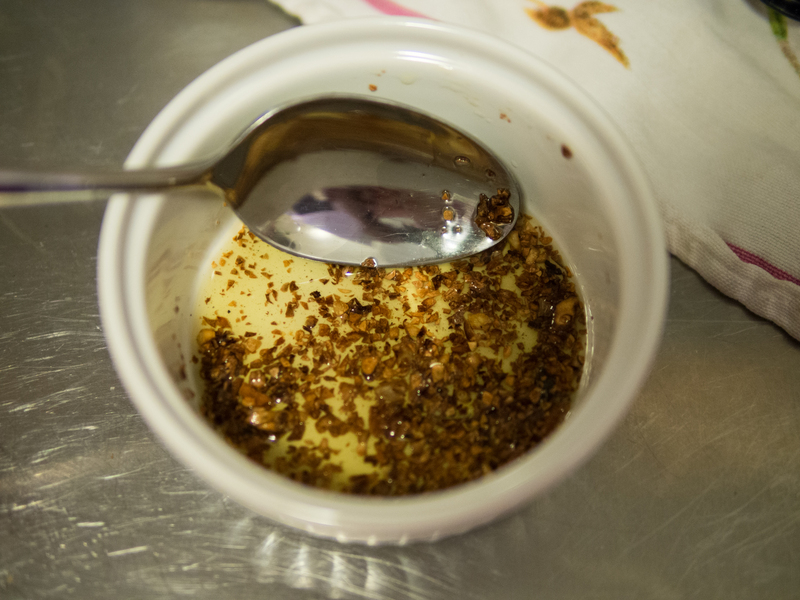 Right before serving, mix in dressing. Top with herbs.